As part of the materiality analysis or as a separate exercise, Datamaran 4 can be used for benchmarking against sector peers, geographies or wider sectors. Users can track 100 non-financial topics by sifting and analyzing millions of data points from the world’s 7,000 largest companies. The sources analyzed include over 77,000 publicly available financial, sustainability, and integrated reports, as well as SEC filings. The Natural Language Processing (NLP) technique – that analyzes text (narratives) and derives meaning from human language – is then applied to these data sources to extract comparable information. As a result, the platform provides with an evidence-based perspective into strategic risks as well as reporting patterns relevant for a particular company. 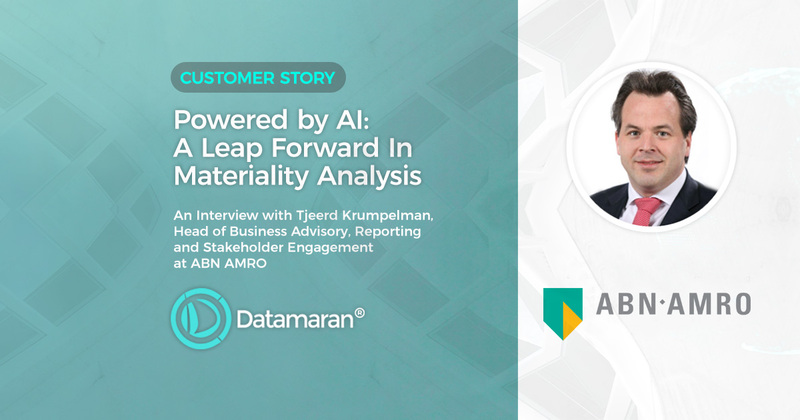 ABN AMRO explains how to improve efficiency and breadth of your materiality analysis, make it auditable and fully transparent in the exclusive customer story.